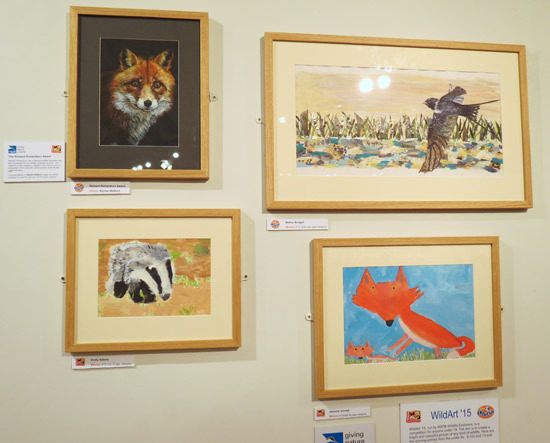 The fans were out in force last week for the Private View of the 52nd Annual Exhibition of the Society of Wildlife Artists. 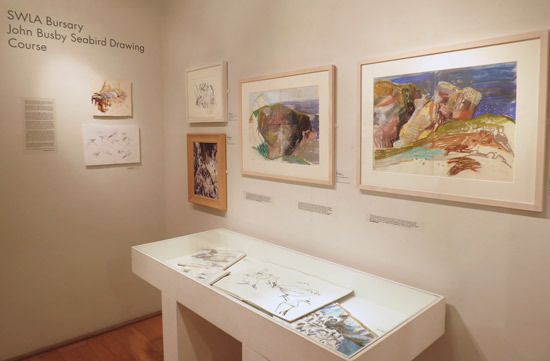 It continues at the Mall Galleries until Sunday 8th November. 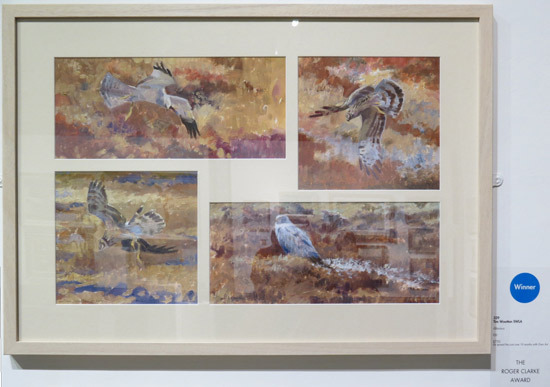 The exhibition takes "The Natural Eye" as its name and one of the things which is very evident from the work in the exhibition is that this is very definitely a society whose members are not afraid to try and capture wildlife in paint while working from life and observation in the field. ...and sometimes after death - when you also do not have long to linger on your artwork. I was very surprised this study did not win a prize. That habit of making art from observations in the field is one which very obviously extends to the non-members. 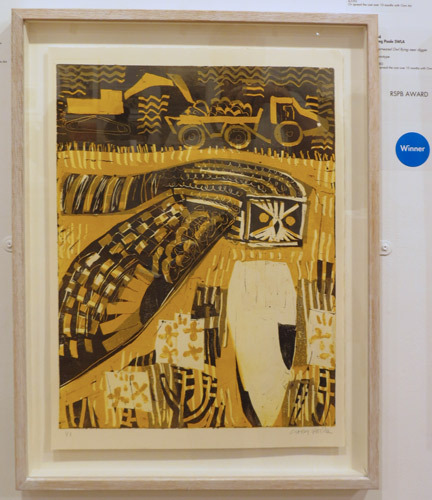 For example see this wonderful drawing by Chris Wallbank. 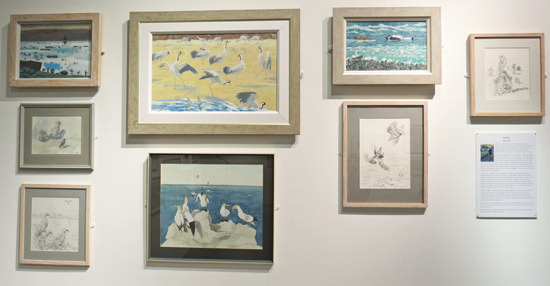 You can also read about his experience of drawing the Loomery at Skomer Island off the Pembrokeshire coast on his drawing blog. 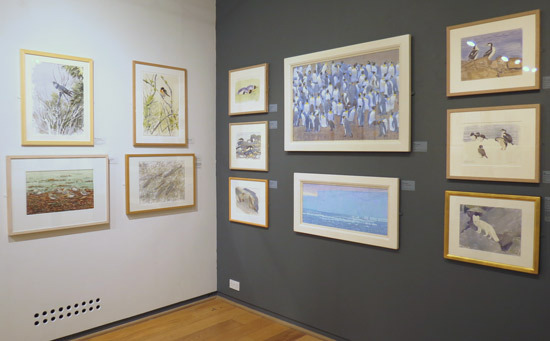 Unlike a number of other wildlife exhibitions, the paintings are not trying to be photographs and the evidence of the artist's personal preferences as to how they see their subject and how they prefer to make their mark - whether drawing, painting, print-making or in 3D is there for all to see. There is, as always, a wonderful variety of work in many different styles by artists who are very accomplished. I confess I can't ever recall an artwork involving a dead sperm whale in the exhibition in previous years and this was a first for me! a number of different projects related to bursaries or ones which have engaged members during the course of the year. 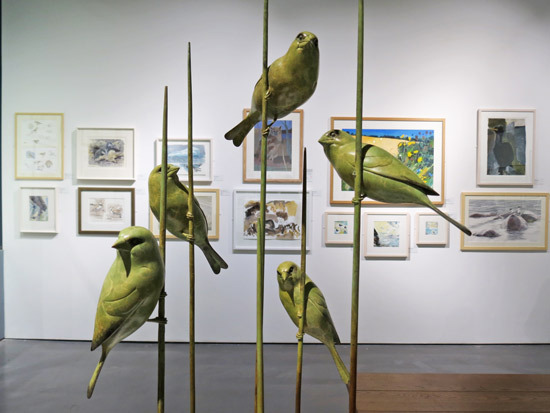 very definitely has members who do more than submit work to an annual exhibition once a year. Their project work is very impressive. takes the science as seriously as the art! At the far end of the North Gallery is the SWLA Flight Lines Project. 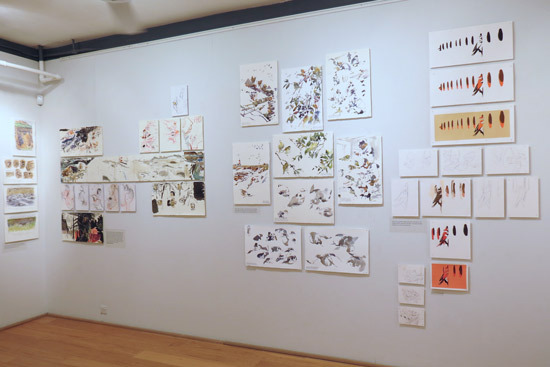 This relates to the pathways taken by migrating birds and enabled some of the overseas members to take part as they documented what happened as birds passed through their part of the world. There were also displays for the bursaries and other projects. 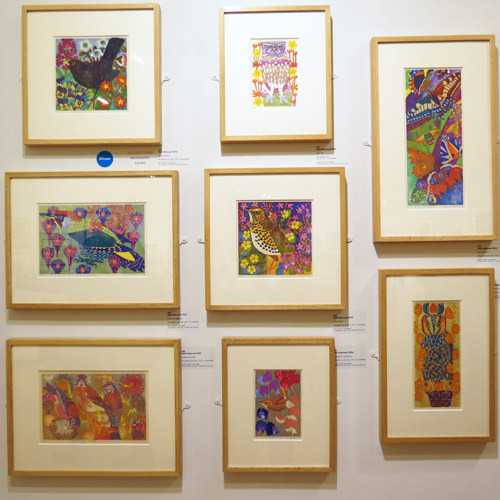 The exhibition also contained three exhibits for members who died in the last year. 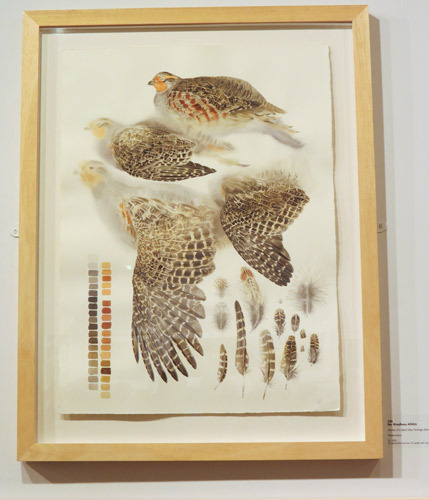 This is the exhibit for John Busby who was the author of "Drawing Birds (RSPB) ". Other panels provided exhibits for Keith Shackleton (middle) - who would be familiar to many of my older readers as the man who used to co-present 'Animal Magic' with Johnny Morris - and David Koster (right). 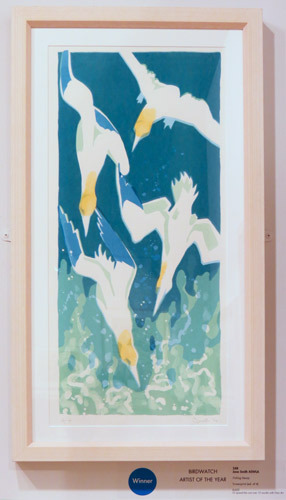 There's a huge sense of movement and purpose in this screenprint. 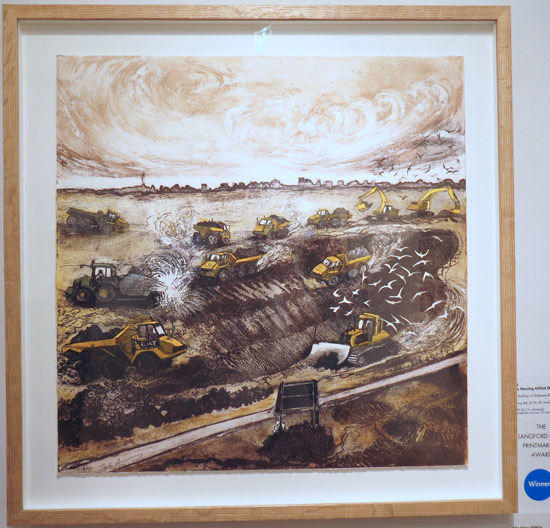 I was very impressed by the fine art print which won the Drawing Prize. I'm a big fan of this type of composite drawing. An Artist Underwater. 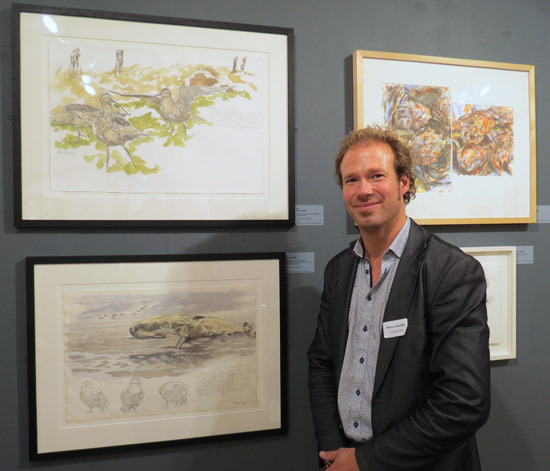 Tuesday 3rd November, 11.30am and 2.30pm; an illustrated one hour talk by Chris Rose on his latest work, based on his experiences as recipient of the SWLA Wildlife Trusts Diving Bursary. John Clare and Me. 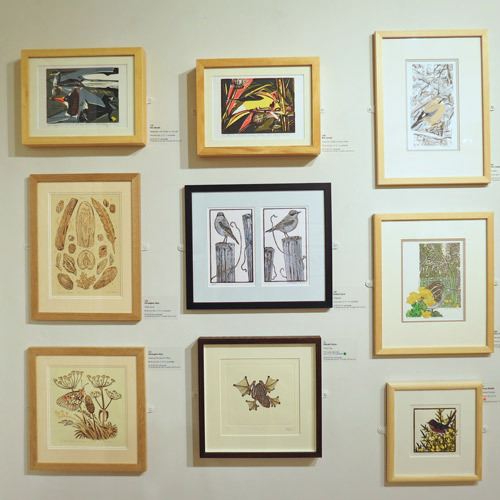 Fri 6th November 2.30 pm; an illustrated one hour talk by Carry Ackroyd on the poetry of John Clare and how his words has influenced her work. 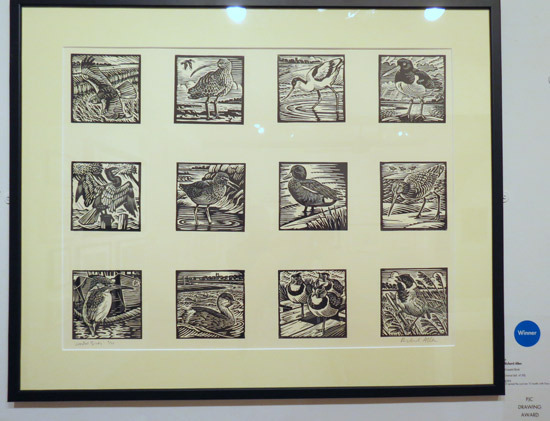 Drypoint Workshop with Bruce Pearson and Greg Poole - Sunday 8th November, 10.30am – 4.30pm (£75 or Friends £65). ; a full day drypoint printing workshop. and Which art society exhibition sells the most works of art? Make art in Rome - on a scholarship! 23rd November 2015: Who's made a mark?